Most of the books I’ve loved in recent times have been recommended by friends. This one was recommended by IHM. Luckily for me, I found it in the Kindle store immediately, but getting to read it, took longer as I had so many books piled up to read. I finally read it, loved it, drafted a review but it took a FB group to remind me that I still hadn’t posted it. The last few weeks have been busy. At work and home and the last thing I have energy for is to write a blog post. I’m so knackered that all I want to do is head to bed. And that’s what I end up doing, most days. So. Back to the book. ‘The Temple is Not My Father’ is a short novella based on the system of Devadasis in Southern India. Devadasi literally translates into ‘Servant of God’, and girls used to be dedicated to the worship and service of deities in temples. This used to be a position of privilege and most of these girls went on to become accomplished dancers. The system continued until the British outlawed the kings and kingdoms in India, leading to the temples losing the patronage of the kings, and consequently their biggest source of income. This ended up in devadasis getting forced into prostitution. This is the story of Godavari and her daughter Sreeja. Godavari was tricked into becoming a devadasi by her own father. It is a heart-wrenching story of a woman, caught in circumstances out of her control, treated like vermin by the same society that forced her into the situation she was in. All she wants is for her daughter to have a good life, a life as far removed as possible from her own. The author does an amazing job with the story. In a short, simple story, she packs in so much. So many emotions, so many motives and people of all sorts. The ruthless father, the determination of two mothers, Godavari and her own mother, the callousness and hypocrisy of society and also the open-mindedness which sometimes comes with innocence. Beautiful characterisation, beautifully articulated situations, which call out to the reader. And the last line of the book, that was one killer line. One that will stay with me forever. It is a book I will re-read, even though I know it will make me cry, all over again. A beautiful book, an absolute must-read, in my opinion. And for me, an author, I will be following. A 5/5 from me. Rasana is the author of Amazon bestseller ‘Tell A Thousand Lies’, which was also shortlisted for the 2012 Tibor Jones South Asia award. UK’s Glam magazine calls this novel one of their five favourite tales from India (June 2014). I’ve come to really enjoy travelogues. Of all sorts. This was another Goodreads recommendation, based on the books I have read and rated. The description had me hooked. ‘One of the largest rivers in the world, the Indus rises in the Tibetan mountains and flows west across northern India and south through Pakistan. It has been worshipped as a god, used as a tool of imperial expansion, and today is the cement of Pakistan’s fractious union. Alice Albinia follows the river upstream, through two thousand miles of geography and back to a time five thousand years ago when a string of sophisticated cities grew on its banks. “This turbulent history, entwined with a superlative travel narrative” (The Guardian) leads us from the ruins of elaborate metropolises, to the bitter divisions of today. Like Rory Stewart’s The Places In Between, Empires of the Indus is an engrossing personal journey and a deeply moving portrait of a river and its people.’ says the blurb, and I just had to get hold of it. Albinia, a British journalist, fascinated by the River Indus, and the civilizations and religions that it spawned around it, travels up the river, from its delta in Sindh, to the place of its origin in Tibet. As she travels through Pakistan, Afghanistan, India and Tibet, she also narrates history, and links it up to the present world and culture. The Sheedis in Pakistan, who could trace back their ancestors to Africa and to the first African disciple of Prophet Mohammed, the life, and hierarchy of Pakistani society after the Partition, the Aryans and India as it had been. The way of life in India a few centuries ago, when religions co-existed, peacefully. Fascinating tidbits and facts – both historical and contemporary ones. There is a lot more of Pakistan than India, in the book, but that is of course a given, since Indus is almost completely in Pakistan now, but she still manages to link the common history of the region with the mighty river flowing through it, really well. A wonderful mixture of history and culture with Indus as the ever-present protagonist. The river which is mighty, deep, mysterious, divine and a lifeline to those who live by it. For centuries, Indus was more than just a river. At one point in history, conquering the Indus was equivalent to conquering India. The books spans from the Vedic times to today’s world, touching upon Kargil, the demolition of the Bamiyan Buddhas amongst other important recent developments that impacted the subcontinent. The author’s meticulous research is evident in the book. And her evident interest in her subject. Conversant in Urdu and Hindi, she is able to converse with the locals, and live like them, fasting during Ramzan, living in their houses during her travel, almost becoming one of them. The author’s enthusiasm, and zeal left me amazed. The journey that she undertook, couldn’t have been easy by any standards, through one of the world’s most volatile regions, potentially one of the most unsafe regions for a woman to travel alone, is one of the bravest things to do. A lot of travelogues have the authors being enraptured by the subject, in this case, she is utterly fascinated and yet objective, fascinated enough to have researched her subject thoroughly, and objective enough to analyze it all, so very well. I just did not want it to end. I wished she could go on and on, I wished I had learnt history reading books like these. A totally recommended read for anyone who loves travelogues and history – such a marvelous combination, handled in such a wonderful manner! Another Goodreads recommendation, that I absolutely loved. I haven’t done a book review in a while, but as I read this book, I felt I had to write about it. After reading the book, I have to say, I was not disappointed in any way. 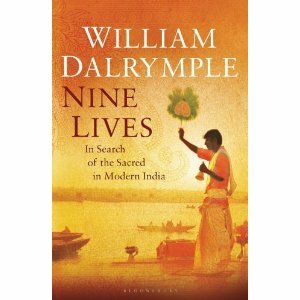 Dalrymple, covers nine lives, nine people, who have given up materialistic lives and turned towards the spiritual. Spiritual ways that are as diverse as possible from each other. From a Jain nun who pulls out her hair one by one, as part of her vocation, to tantriks who live on cremation grounds. Each just as spiritual, just as believing in their path to divine happiness. The best part of the book, for me was the way it is written. The author chronicles each story with such compassion, honesty, and being totally non-judgemental. It takes you right to where the story unfolds and gives you an insight to what might be propelling people to give up their lives for what they consider their faith. He lets their words say their story. A fascinating account of how diverse India really is, and how beautifully all these diverse faiths and beliefs have lived together, in peace. How Hindus go to Sufi saints for blessings, and how Brahmins get blessings from a Dalit temple dancer. When trouble comes calling, people are ready to try anything that might work. This book is all about how faith intermingled with modernity, of how the old traditions are still revered and followed, even if some of the people who actually keep these traditions alive find it difficult to lead lives without taking on other jobs in order to make ends meet. It also indicates how these practises might soon come to an end. In case of the illiterate story-teller in Rajasthan, the book talks about how education seems to threaten this ancient at of storytelling. For some reason, when people get educated, their ability to read seems to reduce their ability to remember the epics word by word. Interesting, isn’t it? I would give it a 5/5, for being the most fascinating book I have read in recent times. I would recommend it to anybody who is interested in historical and cultural books.